Innovation is widely recognised as an important driver of a diversified regional economy. To enable innovation a shared regional vision that is grounded in an analysis of regional strengths and weaknesses is required along with the development of a favourable environment for entrepreneurship and business growth. The New Industries Fund (NIF) is a $16.7 million State Government program that has been designed to support venture creation and accelerate business growth to diversify the Western Australian economy and create new jobs. To optimise State-wide economic outcomes, $4.5 million of the NIF has been allocated to the State’s nine regions as sub-program referred to as the Regional New Industries Fund (RNIF). Each of the nine Regional Development Commissions are establishing and coordinating a Regional Innovation Partnership in their region. The Partnership is to be inclusive and consist of an appropriate mix of public, private and academia stakeholders with an interest in innovation and business growth. To access RNIF allocations each Partnership will develop a regional innovation roadmap, action plan and project proposals that build and enhance their region’s economy. In May 2018 the Commission hosted a Regional New Industries Fund Roadshow to gather potential Partnership members to learn about the conditions required for regional innovation, the workings of the Fund and begin brainstorming priorities and projects for the Peel. 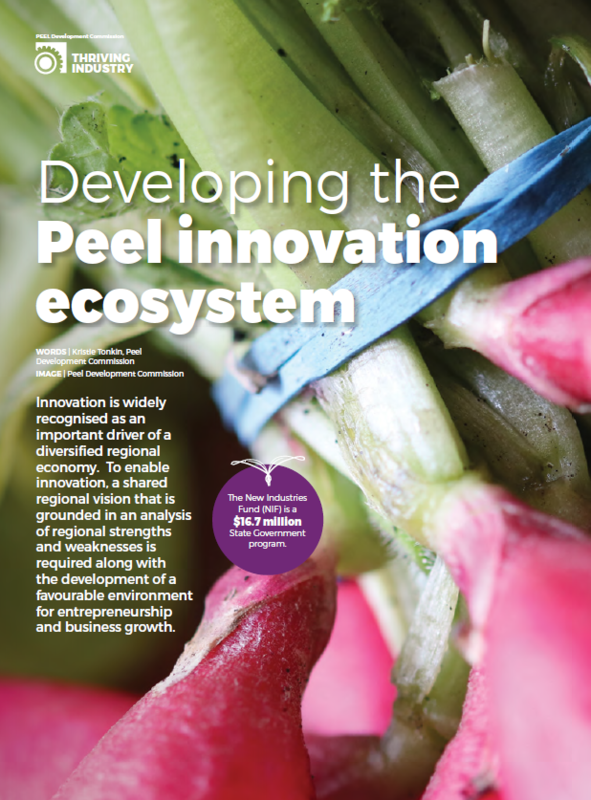 The next step was to create a Peel Regional Innovation Roadmap. A draft Roadmap has been developed and is reflective of the objectives and strategies outlined in the Peel Regional Investment Blueprint. The vision of the Roadmap and Partnership will act as a foundation for a developing innovation agenda in the Peel. Talent, skills and entrepreneurs – The growing population in the Peel provides an opportunity to develop human capital and build a highly skilled workforce to underpin the economic growth of the region. The thriving future envisioned for the Peel will demand a high skilled and flexible workforce that is able to engage with and innovate within a diversified industry base. Education and training systems that develop subject-specific expertise, creativity, critical thinking, entrepreneurship, STEM and communication skills are core to future innovation and productivity. Investment and Infrastructure – The Peel has a strong transport network which is well place to be strategically built upon to deliver strong market access to the domestic and international trade market. The region’s telecommunications network is well developed with minimal connectivity issues to be addressed. Availability of and capacity to access capital necessary for major infrastructure projects and business development is a key inhibitor to innovation in the region. Culture and collaboration – The Peel economy is characterised by a large number of small to medium enterprises, with many sole traders. Through collaboration these businesses will benefit from accessing a range of capabilities and knowledge, enhancing their competitiveness and accelerating their innovation process. Collaboration can also foster partnerships amongst SMEs enabling then to complement each other, access new markets, share research and take advantage of different perspective and resources. Marketing and promotion – Research has shown that aspirations amongst Peel youth are low with many not envisaging a future in the regional economy. Aspirations of SMEs are also marred by the negative narrative of the region portrayed in our local community and media. To establish Peel as a progressive, prosperous and dynamic economy with capability to innovate and create enterprise there is need for a shift to a positive and clear regional narrative and for successes to be recognised and celebrated. Peel Bright Minds – a cooperative initiative with a vision to inspire a curious community. Works with the community to communicate, coordinate and promote regional activities and events that promote and connect people to ESTEAM activities and to encourage an aspirant culture. The Makers – working to bring together Makers from within the community to collaborate, co-create and find new ways of addressing challenges. Operate a co-working space in Mandurah, providing a space for collaboration and cultivation of innovation capacity. Local Government Authority entrepreneurial programs. Programs to build entrepreneurial aspirations and innovation Peel youth. Existing programs include Innovation Institute delivery at Coodanup College, Youth On Leadership delivered by The Makers, The YACC Project delivering an alternative education option. Support to entrepreneurs through networking and engagement initiatives such as Monthly Meetups facilitated by EPICC Training Co and the Global Entrepreneurship Network. The next step for the Partnership is to develop and coordinate applications to the RNIF prior to the end of 2018 enabling funding to the region to begin the journey of an enhanced innovation ecosystem.